I feel like poo. Strike that. I feel like old poo. I wound up running 3 miles today in 29 minutes. That’s not too bad, I guess. I was absolutely beat at the end of the run, though. I had to really push that last mile out to be honest. But I did it, and I’m happy about that. The good news is I haven’t had any pain in my calves this week. The bad news is I have quite a bit of discomfort in the back of my left knee. Speaking of discomfort. Actually no, this isn’t related to discomfort at all. However, while I was walking after my run I had an idea. You know Google Glass? I need Google Glass(es?). I think it would be awesome to have the Google Glass, connect it to my smart phone, and have a HUD (heads up display) of my stats while I’m jogging. No slowing to look down at my arm. Just a simple display of my time, speed, and distance. This would be rad. Today I went for my third run of the week on this crazy new adventure. Things were much better at the start of the run than on Day 2. That tells me that my day off yesterday with just a walk was the right thing to do. I’m curious to see how I feel tomorrow. It will tell me if I should switch to an every other day run or not. The other thing to mention is that the students are returning to campus and traffic slowed me to a stop twice. I may have to alter my route for the next week or so. Anyway, I would up running 3.1 miles over 30:15 minutes. I’m happy with the distance but not the time. And that is okay. I decided to take the day off from jogging, because my legs hurt so so much. That’s what I get, I suppose, for not doing any real cardio since my hockey season ended. Still, thanks for the reminder that I’m 36 years old, my legs. So instead of jogging, I went for a walk. As you can see below, I traveled 3.7 miles in roughly 59 minutes at an average moving speed of 3.8 mph. Went out for my second jog today. I hit the wall almost immediately, at around the 3 minute mark of my run. I chalk this up to soreness from the previous day. I powered through it, though, winding up running for 28 minutes again but at a slightly quicker pace logging 3.1 miles. These numbers are educated guesses, however, as my “My Tracks” app seemed to have turned itself off in my pocket early in my run. I know my start and end times and mapped my path using Google Maps, though, so I think this is fairly accurate. 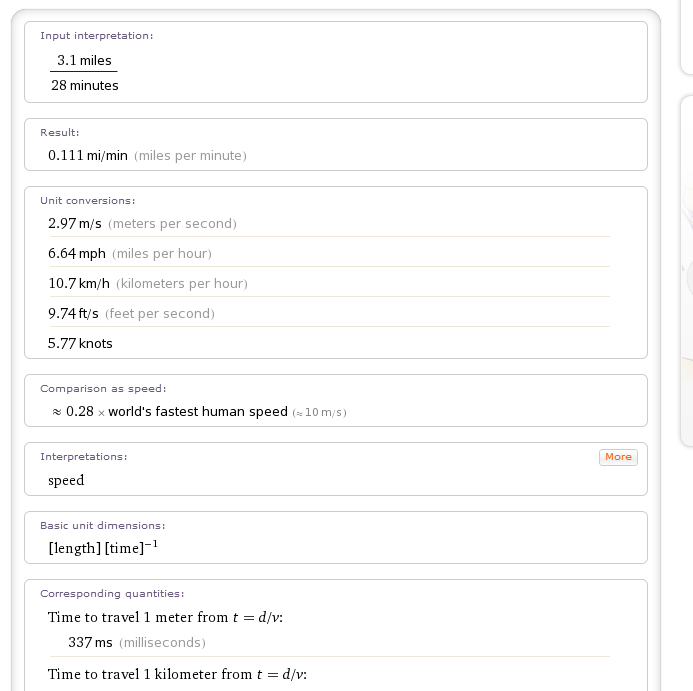 Here are today’s stats, calculated using Wolfram Alpha. Tomorrow, Wednesday will be a walk day. I don’t want to do nothing, but I also don’t want to destroy my legs. Which by the way, my thighs and hamstrings are killing me. Maybe, for once, though, I won’t feel so terrible when the ice hockey season begins. I started what I hope to be a jogging regiment during my lunch hour today. My rational brain tells me it went better than expected, I mean I ran 2.9 miles on my first time out. My competitive brain tells me it was a terrible outing – 10 minute miles, I should be running 5 minute miles! This is all prompted because I finally went and got my “numbers”. You know, blood pressure, sugar levels, cholesterol, BMI. I knew the BMI would be fine. I’ve always been on the thin side. I had a sneaking suspicion about that cholesterol though, and I was correct. Time to exercise. I have jogged in the past, but it never really stuck. My Dad is a jogger. Has been since I was a kid. I always admired that. My wife and I also used to jog together, before the kids. Heck, she ran cross country in college. But I could never really motivate myself to stick with jogging. I never really had a reason, I guess. But I think I’m ready now. I mean, I do want to have a healthy heart after all. And I like the idea of being a part of the running community. This is a thing I’ve noticed about myself. I have a thing for being a part of a group based on an activity or hobby. I have writing, and blogging, and arcade games, and comic books, and hockey. These are groups of which I’m a member. The funny thing about it, though, is while I’m a member of all of these groups I wouldn’t consider myself a regular in any of them. I have always said I’m pretty good at a lot of things, but great at nothing. I look forward to being good at running. Technology is on my side. My wife and I purchased smart phones for the first time this summer. I picked up a Galaxy S4. It’s a pretty cool device with a bevy of free exercise apps. One such app is My Tracks by Google. It gives me so much data during a run, including distance and how fast (or slow) I’m running. It brings joy to this numbers geek’s heart. Here’s the data for my first run. I plan on posting this data, for myself and anybody else interested in tracking my progress. Excelsior!